The Estonian private security company ESC Global Security fended off pirates attempting to hijack a Greek freighter off the Somali coast on Tuesday. The incident occurred around 15:00 local time by the Port of Salalah. Eight pirates, armed with AK-47 assault rifles and one RPG, were aboard an approaching vessel, according to the company. “[The security company] opened fire after all other deterrence measures had been tried and failed to discourage the pirates,” said Jaanus Rahumägi, company director and former MP. Lockheed Martin Corp., the No. 1 U.S. defense contractor, is the first company to have payments withheld under a new Pentagon rule intended to correct deficiencies with internal systems that track cost, schedules, accounting and purchases, according to the Defense Department. The Pentagon will withhold about $1 million a month in billings from Lockheed’s aeronautics division until the unit fixes longstanding shortcomings with its cost and schedule tracking system, Shay Assad, the Pentagon’s director of pricing, said today in an interview. The money will be paid once the deficiencies are fixed, he said. The Pentagon today informed Lockheed’s Fort Worth, Texas- based aircraft unit that the withholding will start in March with billings made under a new production contract of about $4 billion for as many as 30 F-35 fighters, Assad said. The funds held back will amount to 2 percent of billings instead of the maximum 5 percent, he said. That’s because Lockheed was deemed to have submitted an adequate corrective action plan, which is now under review by the Pentagon’s Defense Contract Management Agency, Assad said. The agency manages the new rule for Pentagon contracts. Lenoir City defense contractorEOD Technology said Tuesday it is laying off 48 headquarters employees. In a news release, the company said it was restructuring its business model in response to federal budget cuts, especially those associated with its work in Iraq and Afghanistan. The release said several government contracts to protect U.S. troops and manage explosive ordnance were expected to extend well into 2012, but have ended earlier than expected because of accelerated U.S. troop withdrawal plans. Following the layoffs, EODT will have 250 American employees and 3,000 foreign nationals. The company said employees who are laid off will be offered severance packages. The company said it is boosting its emphasis on land mine removal and disposal, and expanding its work with the oil and gas industry. The Department of Defense may reduce or deny award fees to government contractors found to jeopardize the health or safety of government personnel, under an interim rule now adopted as final. This rule also modifies the requirement that information on the final determination of award fee be entered into the Federal Awardee Performance and Integrity Information System. Also: “In evaluating the contractor’s performance under a contract that includes the [reduction or denial clause], the contracting officer shall consider reducing or denying award fees for a period if contractor or subcontractor actions cause serious bodily injury or death of civilian or military government personnel during such period. The contracting officer’s evaluation also shall consider recovering all or part of award fees previously paid for such period. House Armed Services Committee Chairman Buck McKeon (R-Calif.) is planning to introduce a bill this week that would bar private contractors and Afghans in a new private security force from guarding U.S. bases in Afghanistan. The bill would make it more difficult for U.S. troops to withdraw from Afghanistan, as many bases in Afghanistan often use contractors for security. Beyond the drawdown schedule, McKeon’s bill examines a problem that has challenged International Security Assistance Force (ISAF) troops as Afghan soldiers have joined them for training and missions. At a congressional hearing earlier this month, McKeon said there were 42 attacks by supposedly friendly Afghans against NATO forces since 2007. The issue has been exacerbated in the past week as four U.S. troops were killed, including two officers working inside the Afghan Interior Ministry. How is it possible that foreign companies can come into Burma, hire a rogue army, make billions of dollars and have no responsibility for what their business partners do? A case before the U.S. Supreme Court may deny victims abroad recourse against corporate-sanctioned abuse. 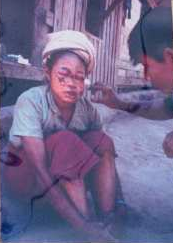 Among the thousands of interviews I’ve conducted as a human rights investigator over the last 24 years, one of the most difficult was in 1996, outside a refugee camp along the Thai-Burma border. I was no stranger to suffering in my country. I had fled from Burma (also known as Myanmar) just a few years before, escaping the brutal military regime after being arrested and tortured. I had gone to the camp to investigate reports that villages were being uprooted and brutalized to make way for a natural gas pipeline built by U.S. oil giant Unocal and other multinational corporations. There, I met a young mother from my Karen ethnic group whose baby had recently been killed by Burmese troops providing security for the pipeline. That was Jane Doe, as she would later be known. She would go on to help establish the legal principle that U.S. corporations can be held liable for complicity in severe human rights abuses abroad. Now, a case being argued before theU.S. Supreme Courton Tuesday may mean that future Jane Does will have no such recourse against corporations. Jane Doe 1 was a poor farmer whose great misfortune was that she was living in the path of the project when Unocal — now owned by Chevron — and its French and Thai corporate partners began building the pipeline. Their other partner was the Burmese military regime, and the corporations contracted with its army, despite its abhorrent human rights record, to provide security for the project. The soldiers forced thousands of villagers to provide slave labor for the project. One of those villagers was Jane Doe’s husband. As Jane Doe told me in the camp, the military forced her husband at gunpoint to clear the jungle and carry heavy loads. When he escaped, the soldiers came looking for him. They found Jane Doe instead, nursing her baby near a cooking fire. She told them she didn’t know where her husband was. The soldiers beat her into unconsciousness and kicked her and her baby into the fire. Jane Doe recovered from her injuries; her baby died. BOGOTA, Colombia — Colombia’s main rebel group said Sunday it is abandoning the practice of kidnapping and will soon free its last remaining “prisoners of war,” 10 security force members held for as long as 14 years. The leftist Revolutionary Armed Forces of Colombia, or FARC, announced on its website that it would no longer kidnap civilians “for financial ends,” marking the first time the rebels have unequivocally renounced a tool they have long employed against Colombia’s well-heeled. It is not clear whether an order has been given to release ransom-kidnapping victims currently held by the rebels, whose number is not known. A sergeant was killed and another injured while attempting to defuse a home-made bomb in the Nusaybin district of Mardin by the terrorist Kurdistan Workers’ Party (PKK) on Saturday. Turkish security officials were informed that PKK terrorists had placed a bomb alongside a road in Söğütlü Village in Nusaybin. After receiving this intelligence, gendarmerie units blocked the road and identified the explosives, which weighed approximately 40 kilograms. The bomb detonated while Spc. Sgt. Cışkun Göl and another sergeant were trying to defuse it. Gök was killed, while the other sergeant received minor wounds. Military officials said the device was connected to a 5 kilometer cable allowing it to be detonated by remote control. Security officials have commenced an operation in the area to identify the terrorists who placed the bomb. Eight months after SA-linked private military company Saracen International was fingered in a UN Security Council as the “most egregious threat” to peace and security in the failed state of Somalia, Saracen continues to run and train a private army in violation of UN Security Council resolutions. Saracen, one of a cluster of shadowy private military contractors born from the ashes of the SA/British mercenary outfit Executive Outcomes, after nearly 18 months of military activity in the region, has yet to secure permission to operate as a security provider in a region so volatile Somalia has not had a functioning central government for upwards of 20 years. Tlali Tlali, the spokesman for the National Conventional Arms Control Committee, confirmed that neither the SA arm of the Saracen operation, nor any of the individuals associated with the Somali adventure had applied for accreditation as legitimate security contractors. UN Somalia and Eritrea Monitoring Group (SEMG) co-ordinator Matthew Bryden confirmed the company had failed to seek or secure authorisation from the international authority to operate as a private military contractor in Somalia after being fingered in the Monitoring Group’s June 2011 report. We understand that the UN is in possession of compelling evidence that Saracen has continued with military training and deployment in defiance of the UN’s general arms embargo. The continuing violations of UN Resolutions 1973 and 1976 are expected to be addressed in detail in the SEMG’s forthcoming annual report at midyear. Afghanistan’s Ministry of Defense says six Afghan soldiers have been killed and 16 others wounded while trying to defuse a roadside bomb. The ministry says the soldiers died Saturday in Mukar district of Baghdis province in western Afghanistan. Starting March 20, U.S. contractors doing reconstruction work in Afghanistan will be required to get their security services from a new Afghan government agency. But contractors are complaining the Afghan agency is charging them excessively high fees for security and putting U.S. contractors at risk by refusing to abide by required federal contracting practices. As a result, doing business with the new security organization — called the Afghan Public Protection Force (APPF) — could force contractors to violate U.S. contracting rules and thus become vulnerable to federal suspension and debarment.